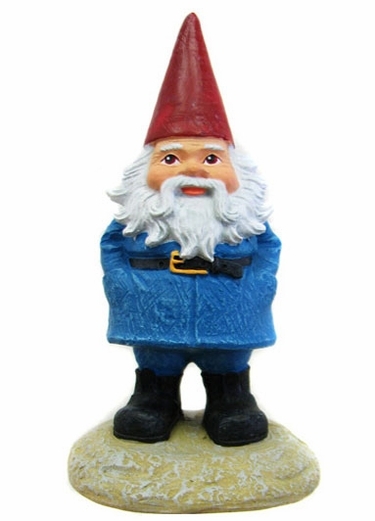 GardenFun is excited to offer this classic 8" Travelocity garden gnome - not the smallest and not quite the biggest, so just right. He's been on the road a long time and would love to take a break in your garden, on your desk at work or wherever you want to put me! Start an incredible adventure with this roaming gnome by buying him for yourself, for your family or for a friend or coworker. They'll recognize him from TV shows, like the Amazing Race, and those awesome Travelocity commercials. He's officially licensed, hand painted and made from durable all-weather cast resin. About me: That's right - I'm the middle child - the one between the 4" and the 18" gnome. But that's okay because I don't have middle child syndrome. After all, I'm a roaming gnome and have looked like I'm 80 throughout my entire life. Makes an awesome garden gift!